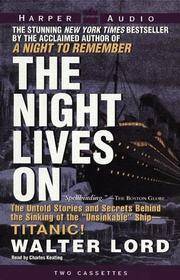 The Night Lives on: The Untold Stories and Secrets Behind the Sinking of the "Unsinkable" Ship-Titanic! HarperAudio, 1998-09-01. Audio Cassette. Good. The Night Lives on: The Untold Stories and Secrets Behind the Sinking of the &quot;Unsinkable&quot; Ship-Titanic! 1998-06-02. Good. Ships with Tracking Number! INTERNATIONAL WORLDWIDE Shipping available. May not contain Access Codes or Supplements. May be ex-library. Shipping & Handling by region. Buy with confidence, excellent customer service!